If you're mourning the disappearance of the chocolate covered almonds and cherries at Costco, these Dark Chocolate Enrobed Mangoes might work for you. 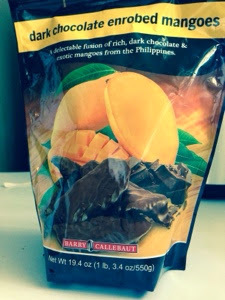 I'm finding Dark Chocolate Enrobed Mangoes are assuaging my sorrow pretty well - maybe too well. I can control how many I eat at one time, kind of. The bag says three pieces equal about 190 calories. Perhaps the best ingredient is the Barry Callebaut chocolate. Barry Callebaut, publicly traded on the SIX, the Swiss stock exchange, as BARN, is the largest chocolate manufacturer in the world, so no wonder the excellent quality of the chocolate. The mangoes come from the Philippines, the finished product is assembled in Canada, and the company, "nature's intent", lists Venice, California as location, (although "nature's intent" was organized in New York city and incorporated in Delaware). The Barry Callebaut website is a source of free chocolate recipes. Like many other folks, I've been trying to figure out if, and when, I need a new iPhone 6 and the best place to purchase. What? You mean, in addition to paying for the phone, the bill goes up? In addition to the cost of the phone, the monthly service cost increases and that increase goes on forever? After research, I decided the best alternative was to buy the phone outright, which, even though expensive would be cheaper. I was surprised to discover that on-line from Apple or in the Costco store, I couldn't buy an iPhone outright. My understanding is that the Costco price is $20 cheaper than elsewhere, and, at Costco, an accesory pack, including a car charger, comes free, so, if you're ready to pull the trigger on the new iPhone, Costco might be your best bet. Valencia Peanuts, with added sweetness and salt, are on sale at my Nashville Costco for 2.75 pounds for $4.97. The peanuts are coated with a thin mixture of salt, sugar, malasses, and honey, but are not overly sweet. According to the label, 1/4 cup is 160 calories. Information on the Internet indicates Valencia peanuts, without added sugar, are 208 calaries, 1/4 cup. Why this differs is a mystery to me. In researching, I encountered once again the unfortunate and confusing situation in Portales, New Mexico, where most Valencia peanuts are grown. The Sunland peanut butter plant in Portales was the source of salmonella poisoning which sickened people in numerous states in 2012. The plant had to file for bankrupcy. 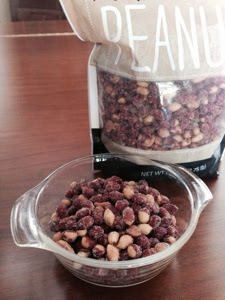 While in the process of going bankrupt, Sunland had accumulated a large number of Valencia peanuts, purchased by Costco to make peanut butter, which Sunland wanted to retain, Sunland wanted to keep those peanuts as an asset and perhaps file Chapter 11 (reorganization) rather than Chapter 7 (dissolution) bankrupcy. However in December 2013, a court decided the peanuts belonged to Costco, and should not be part of the bankrupcy settlement. In May, 2014, the Sunland Portales plant was sold at auction to Golden Boy foods, a Canadian company, but the plant has not started peanut butter production as of September, 2014, and the small town of Portales (20,000) is anxiously awaiting the plant opening. The jobs at the plant were a significant source of town employment. I'm wondering if the Valencia peanut/Sunland/Costco connection is a coincidence, or if these Kirkland Valencia peanuts are part of the crop bought by Costco that never were turned into peanut butter, and were recovered by Costco. 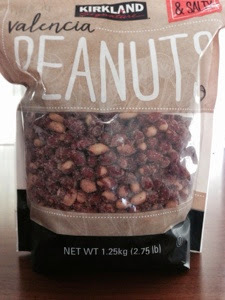 Either way, the Kirkland Valencia Peanuts are a tasty snack, and at $4.97 for 2.75 pounds an extraordinary purchase.